Click on the Galleries tab in the details of the Talent Profile. To create a Gallery, click on the New Gallery button at the bottom right of the page. A pop up window will open giving you several options to choose depending on what type of Gallery you are creating. Type: this determines whether or not the Gallery appears on the website. Select Published if you wish the Gallery to appear on the website or Archived if you with the Gallery to just be saved in Syngency. 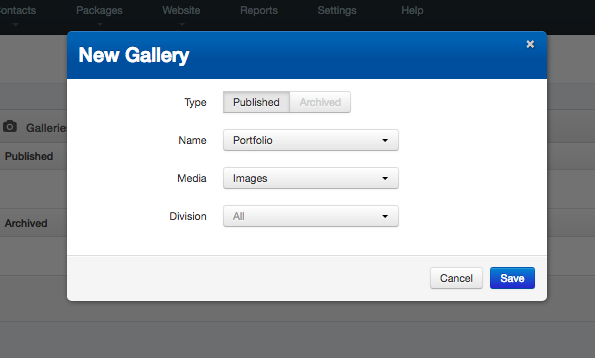 NB You can easily move Galleries between being Published or Archived once they have been created. Name: This is the name of the Gallery and comprises of a dropdown list to select from. Media: This selection is very important, from the dropdown you select what media type the Gallery is for: Images, Video or Audio. NB You cannot mix media types in one Gallery, Images is only for image files, Video is only for video files and Audio is only for audio files. Save: Once you have made all of your selection, click the Save button and you Gallery will appear in the Published or Archived section.